Tobacco drying is presently facing an adverse situation. Drying barns must be retrofitted with heat exchangers that may use 25% or more propane which now costs more than before. To solve the problem, Advanced Dryer Systems, Inc. (ADS), a leader in agricultural drying technology, has invented a new method for tobacco drying called Controlled Ventilation with Heat Recovery (CVHR). Traditional dryers heat up air, blow the hot air through the tobacco and discard it out of the barn, wasting enormous amount of heat. The CVHR method calibrates the exhaust from the barn to match and remove the moisture generated by the drying process. With exhaust air finely controlled, the amount of waste heat is minimized. CVHR reduces further the use of propane by integrating a heat pipe system (US Patent 5,921,315 and others) to recapture the waste heat from both the exhaust air and from the flue pipe of the furnace. CVHR also resizes the furnace to supply heat only in the amount needed. This prevents excessive temperature peaks associated with oversized burners and that may adversely affect the tobacco color. As a result CVHR can dry tobacco using less propane than normally needed while keeping the tobacco at its most valuable color and quality. - Model TD 150 with 150,000 BTUs furnace for barns up to 25’ long. - Model TD 300 with 300,000 BTUs twin furnaces for barns 40’ long. How Does ADS CVHR Save Energy? * The more air coming out of your barn, the more heat you lose. That is why we developed the Controlled Ventilation with Heat Recovery (CVHR) system for our tobacco dryers. * Even with Conrolled Ventilation, you still lose heat through the exhaust air and the flue pipe. 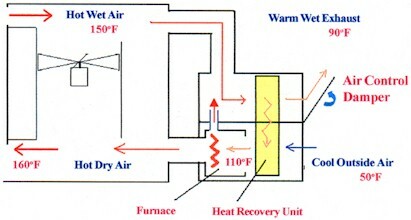 Therefore, we use a heat pipe system to recover waste heat. * Our heat exchangers are certified at 80% efficiency by GAMA, which means that 20% of the heat is still wasted in the flue pipe. Our heat pipe system recovers half of the heat from the flue bringing the overall efficiency of the funace to a proven 90%. * Good insulation of your barn will add more to the savings. All together if compared to barns using oversized burners and heat exchangers with uncertain efficiency, 40% savings in propane or more can be expected with our drying technology, and drying time can be as short as 6 days.